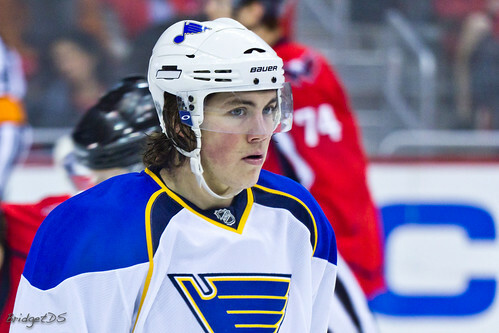 Has T.J. Oshie been justly punished? So were the words of Doug Armstrong, regarding T.J. Oshie, today after Blues’ practice as reported by Lou Korac. Oshie participated in practice today and will play in their next game, and in light of the events of the past few days, that, in all honesty, seems perfectly reasonable. Although some fans may call missing two games too harsh or too light a sentence, depending on their arguments, the fact of the matter is that for what it was, the Blues could not have picked a better pair of games to sit their erring forward for. It is, at this point, harmless. The Blues are not making the playoffs; they’re mathematically eliminated. The club is still playing solid, entertaining hockey which is excellent for the fanbase and even better for individual players, many of whom are playing for next year’s contract, or, in the case of players like Ian Cole and Chris Porter, even a spot in St. Louis rather than Peoria. Oshie is an RFA this summer, and could only benefit from a stretch of solid games here at the end of the season. If the purpose of Oshie’s punishment was to use two games to make him feel regret for his actions, there was no better way to do it than a shootout loss to the Wild and a blowout win over Detroit. Guilt and jealousy, in the form of two different games, could be huge motivating factors for Oshie to clean up his act. Against Minnesota, the Blues could have mailed it in after their decisive 6-3 victory against the same Wild team a few days prior. Instead, they stuck with the other team in support of Chris Stewart’s two goals, and dragged Minnesota to a shootout. A shootout, aka Oshie’s specialty, without the additional help of oft-used Alex Steen, who is currently injured. Although Andy McDonald managed a goal against Jose Theodore in the shootout, Jaroslav Halak was no match for the shots of Pierre-Marc Bouchard and Mikko Koivu, and the Blues moved on with the loser point. So you mess up, get benched, and watch your team lose in a controlled situation that you could immediately have been helpful in. Cue major guilt/regret, and on to Detroit they went. Ten goals. Ten goals they stole from Detroit without Oshie in the lineup, the worst defeat Detroit had been handed since the 90’s, the most goals scored against them in the first 40 minutes since before Oshie was born. If he felt anything but raw, consuming jealousy during this game, it’d be surprising, especially considering the emotions he showed last time the Blues put up nine goals. Maybe, just maybe, this is the responsibility-level tipping point for the young forward. This isn’t Oshie’s first rodeo, either. It’s common knowledge that he was arrested twice while in college at North Dakota; there, however, as Dave Hakstol’s golden children, he and fellow miscreant Jonathan Toews were simply put on probation for their first offense (underage drinking) and when Oshie forced Hakstol’s hand by getting arrested a second time for disorderly conduct a year later, Hakstol slapped him with a one-game suspension. That game ended up being a 3-2 loss to St. Cloud, a game where the Sioux put up two goals and then gave three consecutive goals up to their opposition. It’s not the Blues’ first experience with wayward youth, either; David Perron was suspended for being late to practice two years ago, as was Patrik Berglund last year. Oshie’s punishment has definitely been the most harsh. Hopefully the combination of embarrassment and missing these two games will propel the the 24-year-old forward to take that next step towards a maturity level that benefits the Blues next season, a maturity level that they feel (and appropriately so) he does not have at this moment. Was the punishment harsh? Yes. Would it have been harsher if the Blues were making a playoff push? Probably. The next few games and his behavior for the rest of the season will tell if maybe this little sit-down had any effect. If today is any indication, though, it seems to be working – Oshie just announced that he’s donating his pay from the last two days to charity, since he “doesn’t feel right” about it – all signs, optimistically, point to this having been an excellent decision on the Blues’ behalf.